..For an easy matter, i’ll write communications by decreasing order, from the most recent to the oldest one, by date. The recent ones can be found up in this page. ..By now “ღSlave” Blog is almost 2 years old.. I would like to thank all the Sponsors.They allow me to pursue my passion. Some months was born the Blog’s group,with over 2000 girls blog followers,still growing. I want to give it to all my sponsors..because this website exists thanks to them. I have a Blogger Collaborator: Hullanta Resident. All my Sponsor can send her review copies. This blog was born in February 2011, while months passed i made several changements and, as you can see, posts and pictures got better, and i added more links and usefull pages.. I publish like 1 post par day, today this blog counts 345 posts. In this last month, the blog reached the hightest number of visits, 1795 in the 23th october. 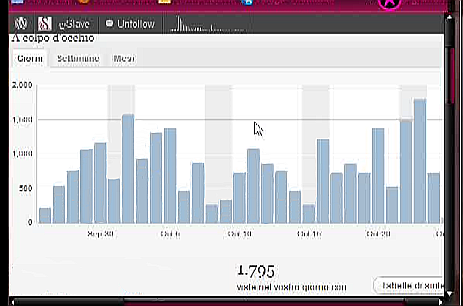 For who’s curious, i took a picture of the statistic with my web cam.